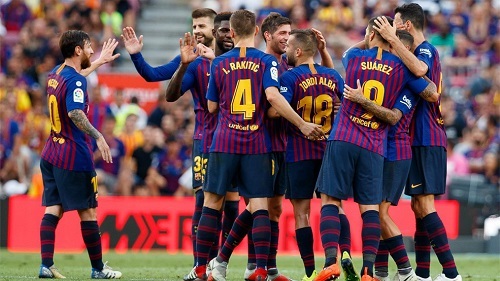 FC Barcelona defeated Huesca 8-2 at the Camp Nou to continue their perfect start to the season. Lionel Messi and Luis Suárez both scored twice each. Action will resume on September 15, when players come back from international duty. FC Barcelona continued their perfect start to the season by winning their third straight match of the young season against newly promoted Huesca, who are competing in the first division for the first time club history. The visitors did not waste time to introduce themselves at the Camp Nou during their first visit in league play, as they managed to grab an early lead, much to the shock of the over 72,000 fans in attendance, after Cucho Hernandez scored from close range in the first minute. Order was restored fifteen minutes when Messi evaded one defender before watching his effort bounce off the far post for the equalizer. An own-goal by Pulido, courtesy of a Jordi Alba cross, in the 23rd minute gave the Blaugrana the lead and Luis Suárez scored the third and final goal of the half for the Blaugrana in the 39th minute. Huesca thought managed to shock the Blaugrana faithful again as Barça’s backline went napping again when Huesca’s Alex Gallar pulled one back three minutes before halftime to make it 3-2. Any concern that this would be a closely contested battle were erased when Barça scored three goals in the first eighteen minutes of the second half to make it 6-3 courtesy of goals from Dembélé, Rakitic and Messi. Jordi Alba made it 7-2 in the 79th minute, and Suárez converted from the spot to make it 8-2 deep in stoppage time. This result meant that Barça and Real Madrid as the only teams in the league to win their opening three games, with the Blaugrana occupying top spot courtesy of a better goal differential. Barça will resume action on September 13 when they travel to Basque country to face Real Sociead. FC Barcelona: Ter Stegen, Sergi Roberto, Piqué, Umtiti (Lenglet, min. 65), Jordi Alba, Busquets (Arthur, min. 75), Rakitic (Arturo Vidal, min. 70), Coutinho, Messi (c), Dembélé & Luis Suárez. SD Huesca: Werner, Miramón, Pulido, Etxeita, Luisinho, Gallar (Semedo, min. 65), Musto, Melero (c), Moi Gómez, Longo (Gürler, min. 57) & Cucho Hernández (Ávila, min. 70). Goals: 0-1, Cucho Hernández (min. 2); 1-1, Messi (min. 16); 2-1, Pulido (min. 23 – own goal); 3-1, Suárez (min. 39); 3-2, Alex Gallar (min. 42); 4-2, Dembélé (min. 48); 5-2, Rakitic (min. 51); 6-2, Messi (min. 63); 7-2, Jordi Alba (min. 79); 8-2, Suárez (min. 90+2 – penalty). Cautions: Luisinho (min. 25), Musto (min. 85) & Arturo Vidal (min. 86). Previous PostBarça drawn with Spurs, PSV and Inter in Champions League. Next PostBarça battle Sociedad to a 2-1 win.